Agricultural practices are the main stay of the people of Uttranchal. Out of the total population, more than 75% people are engaged either with the main occupation of agriculture or its allied practices, dominated by traditional subsistence cereal farming. Among them, the main crops are rice, wheat, millet, barley, all types of pulses, all types of oilseeds and almost all types of fruits. The crops, vegetables and fruits of all varieties are grown in the different climatic zones such as tropical, temperate, and cold because, the region is characterized by the different altitudinal zones elevated from 200 m to more than 8000m. As a result, different climates are found from hot tropical to sub temperate and chilly cold. Pulses varieties are grown extensively. Among vegetables, potato, onion, carrot, all types of green leaf vegetables, brinzal, pumpkin, ladyfinger, pea, gram, radish, ginger, garlic, etc, are grown widely. All fruit varieties are grown in the different altitudinal zones. The main fruits are orange, malta (a big size of orange), elephant citrus, lemon and all other types of citrus, apple, stone fruits including peach and pears, many kinds of nuts, and the fruits which are grown in the low lying areas. In spite of feasible climatic conditions, agricultural dominant society, and availability of all types of crops, the production and productivity of these crops are very low, even they are unable to meet the grain-need of the people in Uttaranchal. Agricultural crops are grown almost in all the altitudinal zones — from the low-lying areas, which are called ‘Gangarh’, to the highly elevated region, where the legendary term is given as ‘Danda’. The growing seasons vary according to the heights. 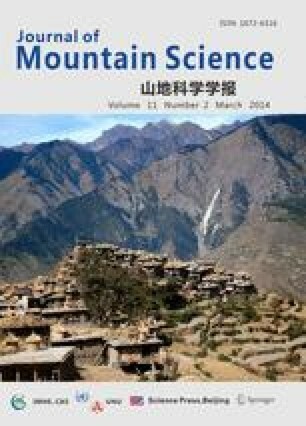 The present paper aims to discuss the agricultural practices including cropping season, cropping pattern, land use, production of crops and ecological aspect of agricultural system in this Himalayan state and suggest some measures for developing farming system, which could lead the sustainability, in terms of meeting the food grain needs of the people on the one hand and restoring the ecological balance on the other.